For the first time, I made cake pops last Wednesday. Simple ones though. 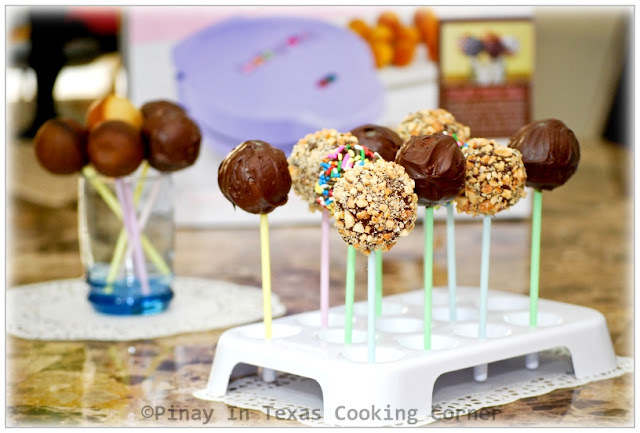 I adapted the recipe for Chocolate Cake Pops from the manual that goes with the cake pop maker. I just made some adjustments based on the availability of ingredients in my pantry...and VOILA!!! This Babycakes Cake Pop Maker is available online at Amazon and thebabycakesshop.com. You can also get it at Kohl's and Bed Bath & Beyond. For the price of $19.99-24.99, I can say that this is such a good buy. Cake Pops are sold for $2-$7 each in bake shops depending on the flavor and coating. Imagine how much money you could save if you can make it in your own kitchen! 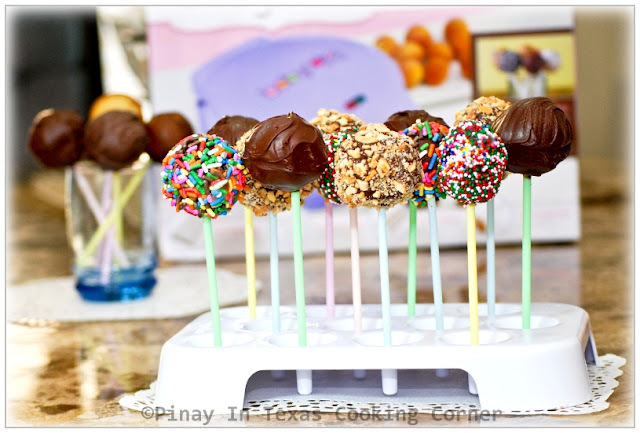 12 cake pops in 4 minutes - I think that's good enough! I made 6 dozen cake pops with simple glaze/coating in less than one hour! 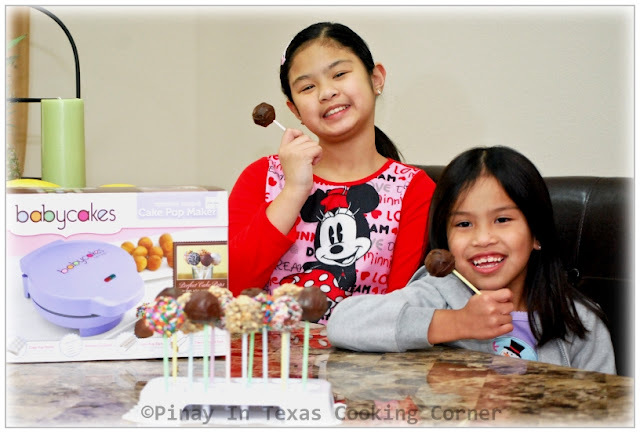 The Babycakes Cake Pop Maker bakes cake pops directly from batter which is much cleaner and quicker compared to the traditional way of making cake pops. And let me tell you that the cake pops aren't dry at all. They are moist and soft as long as you don't over bake them. The manual says to bake for 4-5 minutes. 4 minutes is just right. 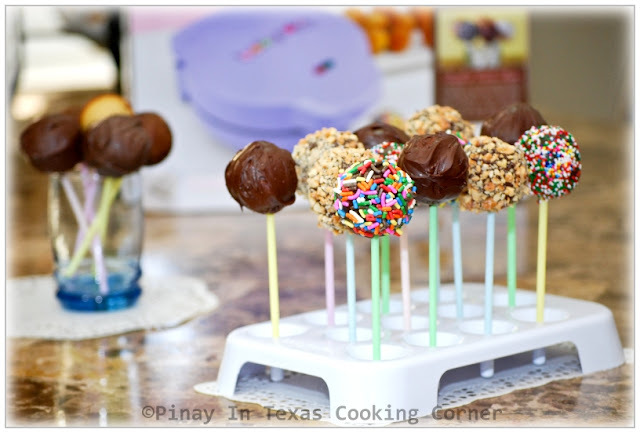 Baking it for more than 4 minutes will make your cake pops dry. 1. Combine flour, sugar, baking soda, baking powder and salt in a mixing bowl. Mix well. 2. Add melted chocolate, buttermilk, olive oil, egg and vanilla. Using a mixer, blend until smooth. Add brewed coffee and continue mixing until coffee is evenly incorporated into mixture. 3. Fill each cooking reservoir with about 1 Tbsp of batter. 4. Bake for 4 minutes. 5. Allow to cool and glaze/coat as desired. 1. 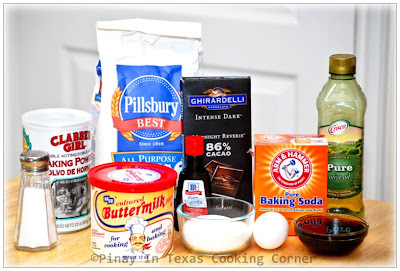 Combine flour, sugar, cocoa, instant coffee, baking soda, baking powder and salt in a mixing bowl. Mix well. 2. Add buttermilk, olive oil, egg and vanilla. Using a mixer, blend until smooth. Add brewed coffee and continue mixing until coffee is evenly incorporated into mixture. 1. Combine melted butter with confectioners sugar, stirring until well blended. 3. Blend in hot water and stir until smooth. coongrats! I bought the tray version I hope it works as well. I promised Johnny to make them for Elvis Presley's Birthday! Hi Tina, I love your new gadget and the cake pop looks so cute. Happy new year to you and wishing you all the best in 2012.
thanks for checking out my blog !! Tina, I like your new kitchen toy. They looks cute. Simple gorgeous cake pops you have made and yes, I think the gadget makes its easier to mould and come up with the pops. I am sure your lovely girls must have enjoyed the pops very much. Its sure a great product but you know for me, the 2 adults who don't like anything sweet and with my daughter all grown up and living on her own, I am not sure whether I want to get the gadget. gosh i always wanted to try that. it looks so good.... thanks a lot for sharing. Tina, these turned out really good! It looks like so much fun, I'll bet the kids love them! My son would love to have couple of those. You did an excellent job! Your girls look really happy! Very cool. I have never eaten or made this but am dying to try. Looks so good! Cake Pop maker? I didn't even know that there is such a thing. I will tell my daughters about this gadget as they like making cake pops. Thank you, Tina! So fun! 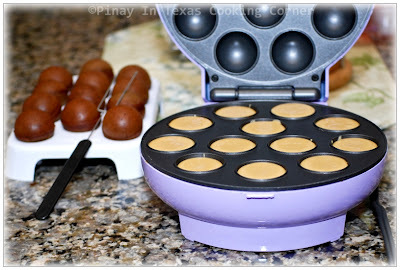 I have the Babycakes mini muffin maker and I LOVE it! I noticed this cake pop maker this year around the holidays and I was wondering if it was a good deal. Your pops turned out so pretty! 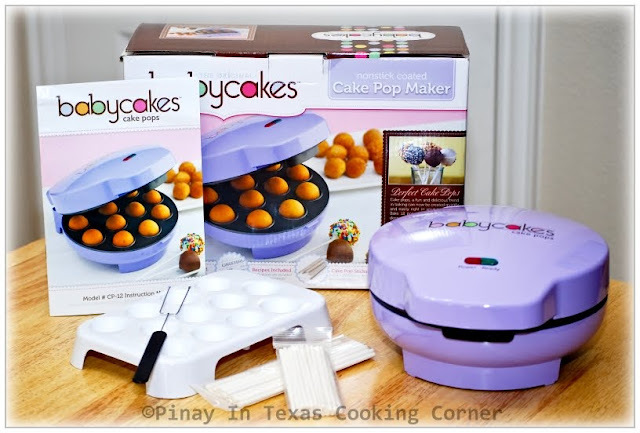 where can i buy babycakes products here in the philippines? I honestly don't know if it's available in stores there...but you can buy it online thru this link.